As per reports, two dedicated women of menstrual age – dedicated both to Lord Ayappa and the constitution of India – have succeeded in breaking the irrational taboo at Sabarimala by entering the sanctum sanctorum and offering their prayers to the deity. Coming after the entry at Haji Ali Dargah, Shani Shingnapur and the delegitimisation of the practice of instant triple talaq, the breakthrough at Sabarimala crowns a year of concerted mass determination to obtain gender justice in the cultural-religious domain long granted by India’s constitutional democracy. The hiatus between the determinations of the Supreme Court on behalf of the rights granted to “we the people” and their lawful and mandatory implementation by state institutions thus continues to be bridged, however contentedly. The imbroglio at Sabarimala underscores a new and pathbreaking maturity of governance by the state. It has long been a theoretical infirmity of the Left to assume that any rational idea must necessarily find instant compliance among the people at large. And should it be resisted, the state should deem itself authorised to resort to a coercive implementation of democratic requirements. Such insistence, of course, ignores that great Marxist insight which had spoken of the “objective constraints of history” and cautioned that although “men make their own history,” they cannot make it any which way they like. Often, laudable pursuits of equity have thus been vitiated by an unripe refusal to attend to the power of previous social ideas and formations, and by the inability to deal with them with full and patient intelligence. The Pinarayi Vijayan government has thus shown a new and perspicacious way; it has steadfastly refused to succumb to the bait set for it by the violence and resistance of reactionary social forces. Learning a lesson from Nandigram, the Kerala government came to adopt a humane and constitutionally upright two-fold tactic: one, to make it known in no uncertain terms that it meant to adhere to the constitutional imperative laid down by the highest court in the land, and, two, that it would not do so by taking recourse to forceful means. The attempts by the Kerala police apparatus to enable devotees of menstrual age to enter the shrine have been credible, even if unsuccessful till today. So has been their resolve not to push back the unprepared resistance by crude strong-arm methods. We can be sure that in the long term, this new tactical brilliance on behalf of the governing Left will reinforce and enhance the practice of lawful and democratic governance in other states as well. 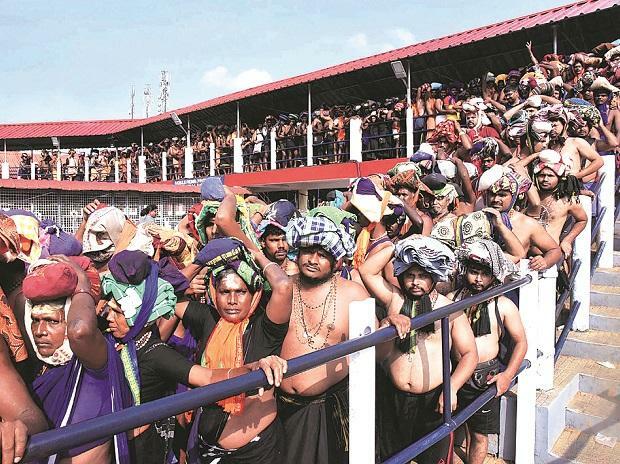 It is to be hoped that the watershed import of the breakthrough at Sabarimala will dawn with full historical force on all those quasi-progressive social forces who have thus far been on the wrong side of history on the issue. Any politics, other than such as bears only lip-service to the constitutional regime, must have as its principle objective the furthering and deepening of constitutional democracy rather than play ducks and drakes with its majesty. No political force that owes allegiance to the constitution may take the view that the Supreme Court’s determinations of the meaning of its provisions can be conveniently optional. The Indian National Congress in that context bears a great onus, and must see its way to putting the constitution above any sectarian considerations. Should its voice indeed become indistinguishable form the Hindutva rightwing’s in Kerala, its guilt in debilitating the hard-won edifice of constitutional republicanism – in such great measure as its own historical contribution – would not just be great but fatal both, to itself and to the republic. And let us salute the 50 lakh or more Indian/Keralite women who took ownership of our enlightened future and prepared an unimaginably stupendous democratic ground to support and bolster that entry. Needless to say, this mega-mass event will go down in India’s contemporary history as a blow on the behalf of reason and constitutional rights – equal to the best we may recall from our struggle for Independence.